The International Space Station (ISS) Expedition 10 crew. NASA astronaut Leroy Chiao will command the mission and serve as ISS science officer. Cosmonaut Salizhan Sharipov, of the Russian Federal Space Agency, will comand the Soyuz spacecraft to reach the ISS and serve as the station's flight engineer. The crew of the International Space Station (ISS) started off 2005 with a familiar glitch, a malfunctioning oxygen generator that has led flight controllers to dip into air supplies aboard a recently arrived cargo ship. After three failed attempts by ISS Expedition 10 flight engineer Salizhan Sharipov to repair the Russian-built Elektron oxygen generator, flight controllers in Russia tapped into the oxygen stores aboard the Progress 16 supply ship to repressurize the station while they continue to work the problem, NASA officials said today. 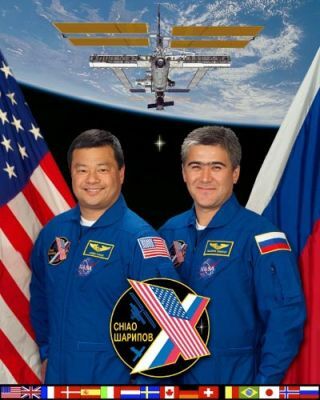 Sharipov and Expedition 10 commander Leroy Chiao are in no danger and have an ample supply of oxygen onboard that will last well until the next cargo ship's arrival later this year, they added. "We're good on oxygen," NASA spokesman Rob Navias told SPACE.com. Russian flight controllers used 7.1 pounds of the 110 pounds of oxygen and air aboard Progress 16, which arrived on Dec. 25 and contained about a two-week supply, Navias said during ISS mission commentary today. Additional oxygen sources aboard the ISS include a 42-day supply in the form of solid fuel canisters, as well as two full tanks inside the U.S.-built Quest airlock. While the Elektron device, the station's main oxygen generator, stopped functioning early on Jan. 1, it is not the first time the equipment has failed. The station's last crew, Expedition 9 commander Gennady Padalka and flight engineer Michael Fincke, also had their share of frustration with the device in September 2004. Ultimately, working with spare parts delivered during Expedition 10's Oct. 16 arrival, both station crews were able to repair the device. Russian engineers believe gas bubbles may have caused the most recent Elektron shutdown, but subsequent repair efforts by Sharipov - a veteran cosmonaut with Russia's Federal Space Agency - have proved unsuccessful. NASA officials said Sharipov tried to flush the bubbles out with an external circulation device built by Padalka for the same purpose, but it appears the bubbles may have migrated into that device as well. Russian engineers continue to go over data from Sharipov's repair attempts, Navias said, adding that the Expedition 10 crew could also use spare parts for the Elektron, which arrived aboard Progress 16, should they be needed. "The Russians have been able to troubleshoot and restore the Elektron generator in the past," Navias said during ISS commentary earlier today. While the non-functioning Elektron is currently the only issue facing the ISS crew, a Russian-built air scrubber designed to remove carbon dioxide from the station's cabin atmosphere did shut down Sunday, NASA officials said. Air scrubbing duties were temporarily performed by equipment in the U.S.-built Destiny module until the Russian device was successfully brought back online, they added.